wedding wednesday no. 9 // 6 months until june! Andrew and I were in the middle of watching “A Christmas Prince: The Royal Wedding” (clearly my idea) when we received a text from his cute mom. SIX MONTHS, Y’ALL. To be quite honest, the wedding has felt so impossibly far away these past few months, but something about reaching the 6-ish month mark (If you remember, I won’t be sharing the exact date until we get married!) has me in a puddle of excitement. For some reason, reaching six months until our wedding month feels so real. So for today’s Wedding Wednesday post, I thought I’d share a planning update with y’all! You can read my last one here. I’ve capitalized the items we’ve checked off since my last update! Well HELLO huge update, am I right? Y’all… I cannot believe I found my dress! I will be sharing so many more details later, but let’s just say it took me so much longer than I anticipated to make a decision. No, you don’t understand. It took FOREVER. I think it’s a mix of being super picky and having so many options here in Dallas, but either way, it was quite the adventure and I can’t wait to spill the full story soon! I will share a fun secret for now… I’m meeting with the designer this Friday to finalize the details and get my dress ordered. Any guesses on what type of style I’ll be wearing? Unlike my dress hunt, deciding on attire for Andrew and his guys was such an easy decision! While Andrew hasn’t picked his exact ensemble yet, he’s planning on using Mister Tuxedo, a shop right here in Dallas, for him and his guys. Fun fact, this is actually where my father got his tux when he married my mom! :) I can’t wait to share more about this process… perhaps we should do a “tuxedo try-on” post featuring Andrew? Leave a comment if you feel this is a MUST like I do! I’m not spilling the details yet, but let me just say I am already counting down the days until my bachelorette party! The process of putting together and planning it has been a dream. Now,I know that technically the maid of honor is the one who plans the weekend, but my sister Steele is new to the wedding thing and asked if I would weigh in on (AKA help plan) the big details. I was actually so excited to say OF COURSE, because I had a pretty good idea of what I wanted right off the bat. We don’t have all of the details nailed down quite yet, but let’s just say, it’s going to be even better than I could have dreamed… a special team I adore may or may not be involved… :) That’s all I’ll say for now! Just like the process of finding my wedding dress taking so much longer than expected, the process of deciding on a florist was just as lengthy! I’ll say it again… there are so many incredible options here in Dallas that it can make actually deciding difficult. We met with so many incredible teams, but at the end of the day decided on the one who could deliver exactly what we were looking for within our budget. That was key for us, and I can’t wait to share more about this soon! Andrew and I finally took our engagement portraits with our photographer John, and let me just say, it was literally one of the most fun evenings of my life. John sent us the full gallery last week, and I literally cried looking through them! I’m selecting all of my favorites to share with y’all here in the next couple of weeks, along with deciding on “the one” we’ll use for our save the date! There are so many that I’m wondering if y’all would be interested in dividing them into two separate posts? We photographed two different looks, so I’m thinking that breaking those into two posts would allow me to share way more with you without getting overwhelming. Let me know your thoughts! Perhaps the hardest task of wedding planning we’ve experienced thus far has been finalizing the guest list. We’re planning on a wedding of about 300 guests, and while that seemed so big initially, it was crazy how quickly those numbers dwindled down when we started putting pen to paper. I’ve literally stayed up at night fretting over hurt feelings, but we have finally come to an official list. Whew. I wouldn’t wish this process on anyone! While I definitely feel relieved to have so much checked off of the list, there are still quite a few things that need to get done this month and by early January. The next tasks on my radar? Here’s the thing. Most, if not all, of my bridesmaids already know they’re in the wedding. We’ve either talked about it for years, or it’s naturally come up in recent conversation. I actually called a few of them to check on bachelorette party dates and had to stop myself in the middle and say “Wait, you know you’re a bridesmaid, right?” Between the holiday craziness and being a pretty unorganized person (I like to call it “creative tendencies”), I haven’t “officially” asked. Which I feel awful about! So, this month, I’m going to create a cute “bridesmaid proposal” to send to all of them! Although I’d love to do a big package, it might just be through a heartfelt letter. Those have been the most meaningful “bridesmaid proposals” I’ve ever received, and since time is of the essence, I know I can get them out efficiently! Thoughts? This one is pretty self-explanatory! We just need to select a photo, and the finalize where we’re going to have them made. But let me tell you… easier said than done! One wedding planning task I’m so excited to undertake… choosing our wedding cakes! And crazy enough, Andrew is excited about this one, too! :) We’ve received a lot of great recommendations from friends and wedding vendors about amazing bakers, but have yet to reach out and schedule appointments. If you have any Dallas wedding cake recommendations, please send them our way! Eek! I’m so excited! I’ve decided on my bridesmaid dresses, but haven’t told my girls yet. Once we get a few details finalized, we’ll hopefully get this done here in the next few weeks! While Andrew and I don’t predict having a ton of out of town guests since our families are both here in Dallas, we definitely want to secure a hotel block for those that are traveling from farther away! Now that the big details of our reception have been decided, I’m so excited to move into the true “design” process. Part of this, I’ve learned, is bringing in rentals (like chairs, stage fronts, etc) to really make the reception especially beautiful. If you’ve used any rental companies here in Dallas that you just loved, would you let me know? I haven’t even started on this! It’s fun to look at all we’ve done, but I’ll be honest… it’s a bit overwhelming to look at what still needs to be checked off! I’m just reminding myself that it will all get taken care of, and to really enjoy the process… even if it’s crazy! :) After all, we have an incredible, talented and capable team already assembled and at the end of the day, this whole thing is really about the marriage, not the party! Before I sign off, I wanted to let you know that if you’re also engaged, be sure to check out my Instagram later today! I’m posting details on a wedding-related giveaway that you don’t want to miss! P.S. 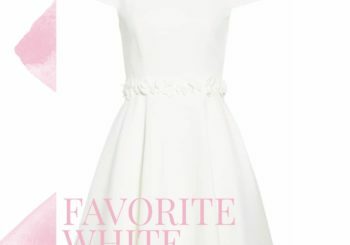 I am constantly getting requests for white dress recommendations, so here are a few new arrivals I’m loving! Do cards, rifle has the cutest “will you be my Bridesmaid” set you can use and write your sweet letter inside I find that best option. Tell them why you want them there on your special day! Registering is so easy these days! We skipped the whole scanner thing (although you certainly can do that as well in store!) and just created our registries online and adding things little by little. We were able to add things to the registry all the way leading up to the wedding as we realized items we needed/didn’t really need. We used Williams Sonoma and Anthropologie and were happy with both! Have you looked at all into hiring a videographer? We love our wedding photos so much but our wedding video is by far the most treasured keepsake from our day. It is def worth it if it works within your budget! I think you can do a lot (meaningful) without doing a whole package for your bridesmaids. I would write the heartfelt letter and maybe include a framed picture of the two of you and a piece of jewelry (bracelet, earrings, etc). Doesn’t have to be too extravagant. Also, I would do up a card that they can have as a reminder for the dates (bachelorette party, showers, rehearsal dinner, wedding) so that they have it all in one place. I’m getting married in June as well, so when I saw the title “six months away” I had a mini panic attack haha. For asking bridesmaids, I did a heartfelt letter and tied it around a mini bottle of champagne, so it was super easy. With registering, there’s a place here in New Orleans where you register but instead of receiving each gift, they send a card saying who got you what and instead you just get credit for the item. So then you can go afterwards and pick what you’d like the most out of everything. It’s a game changer! Look for someplace like that in Dallas because I’m sure one exists. Then I also registered at Williams Sonoma for some basics after a friend pointed out that you can use their gift cards at pottery barn as well. This will be really useful when we buy a house! I do have a question for you. My sister chose to change out of her dress for the last hour of her wedding, but I’m trying to decide if this is something I want to do. I see all these beautiful pictures of exits in the wedding gown so I’m not sure I want to miss that opportunity. Any thoughts? I did flowers for my bridesmaid proposals and they LOVED it. I don’t know a gal who doesn’t wish she had more dramatic flower deliveries in her life. Fairly affordable, left them with no random junk to haul around, and totally cute! Hey girl! I’m in the same process as you, but much longer engagement (got engaged last Christmas and are getting married Oct 2019). I started by looking online at stores and looking at their registry guides. They outline it nicely in an organized way so it’s not too overwhelming. We ended up going with Macy’s and Pottery Barn based on the selection and price point. We did look at tons of other stores, but wanted stores that people could order online or at the store easily. Hope that helps! My husband and I registered a few places but our favorite was Crate & Barrel. They have special events for registered where they open the store early, give a small gift and some free champagne, and let you run wild with your scanner without too many other folks in the store. In addition to that, my husband and I have been super impressed with the quality of everything we got from there! For our cake, we used Tarte bakery on Lovers. The cake was beautiful and delicious (like our friends still talk about it now, two years later, delicious)! And they’re really open to customizing, combining multiple flavors, etc.! I just got married in August and while I’ve been out of school and accumulated things, it was so exciting to register! We really thought about what we needed most and what we wanted to replace. I got china as an investment (even though I haven’t used it yet), new everyday dishes, and all the general things. We registered at Crate & Barrel, Pottery Barn, and Williams Sonoma. I recommend registering for a LOT, especially in the $50-$100 range. Register places you know you’ll want to shop with leftover return money. People want to buy you gifts rather than giving money (more personal, it feels), and if you’re having a lot of showers, items will go quickly. So even if you have overlap on items, you can always return and put money towards a larger ticket item, like a coffee table (guilty)! I have THE BEST advice for your guest list! I know it’s finalized ,but this tip saved my life & hurt feelings. Create 2 lists: The A Team (your finalized guest list) and The B Team (horrible I know). Order 2 sets of RVSP cards– One card with an early date and one card with a later date. You send out your A team with the early RSVP card and as you receive regrets, you pop an invitation in the mail for your B team. My husband and I both come from HUGE families and moved around a lot after college which resulted in a ton of friendships along the way. We wanted to celebrate with everyone, but venue restrictions had other plans. This allowed us to invite people who would have otherwise been cut, yet we wanted to share the day with them. It sounds horrible when you write out ‘the B team’, but sometimes you have more special people in your life than a venue can hold. So exciting!!!! I’m getting married October 2019 and I plan on going wedding dress shopping (In Dallas)next month (January). Would it be possible to include a Dallas wedding dress shops recommendation list in a Wedding Wednesday post? I am so overwhelmed and have no idea where to start! Have you picked a first-dance song yet?? I’m currently engaged (our wedding is in January!) and I was also daunted about registry. I HIGHLY recommend going into the store of wherever you register. I had the moment of “do people even do that anymore? !” because you can basically do everything online these days. But going into the store helps SO much and often times whoever is in charge of the registry has been doing it for a while or is very knowledgeable about their products (hello, Williams Sonoma). It makes the process fun and you’ll be more confident about your choices! Also, I recommend putting anything you remotely like or want on your list and editing online later. There’s always the power to delete items you realize aren’t for y’all!